Exciting things in the works for Grand Bahama! David Johnson President of The Grand Bahama Island Tourism Board interviewed at Mackeymedia discusses with Web Master Dave Mackey numerous positive developments presently taking place and those about to take place in the not to distant future. Including: The acquisition of Go Grand Bahama Vacations by the GBITB and its positive implications, The Gold Rock Creek Movie studio & The Disney Pictures filming of Pirates Of The Caribbean 2 & 3on Grand Bahama Island along with the numerous opportunities now available as a result of Grand Bahama Island becoming a frequent site of major motion pictures. Mr. Johnson also talks about the plans in the works for the relocation of the harbour away from the the industrial container port area to a more aesthetically pleasing one for cruise ship passengers. Other important points mentioned in this exclusive interview are: Grand Bahama's swift recovery after being hit by Hurricanes Frances & Jeanne, the shift in the type of visitors arriving on Grand Bahama, the increased number of direct flights from a wider variety of locations, The 2006 U.S. Tax exemptions for off shore corporate meetings and its positive impact on tourism plus lots more. This is an interview that you don't want to miss, be sure and press the play button below to to get the full scoop from Mr. Johnson himself in his own words and voice. There is an upcoming seminar for those interested in the film industry that will take place on Grand Bahama and in New Providence hosted by The Bahamas Film Commission that is discussed in this informative interview. At the age of 29 Zhivargo Laing, the 7th of 9 children, made Bahamian history by becoming the youngest serving cabinet minister in The Government Of The Bahamas. In this motivational interview with webmaster Dave Mackey Zhivargo talks about his present activities as an author and motivational speaker through his company Pro-Life Development Systems, his years as a cabinet minister, The FTAA (through his book "Who Moved My conch") and his future plans and goals. This interview provides a chronological journey through the inspiring life of Mr. Laing a true Bahamian High achiever with lots of ground still left to cover. Email him at: zhivargolaing@coralwave.com. Zhivargo is also available internationally for human resource training, business consultancy & personal development motivational seminars. Contact him to by phone: (954) 281-8788 also visit his web site: www.pldsystems.com. Click on the play button to hear this interview. Note: shortly mackeymedia will provide a sample lesson from Zhivargo's CD: "52 Lessons in Life"
Bahamian Entertainer Wilfred Solomon of Wilfred Solomon & The Magnetics talks about the good ol' days in his interview with Mackeymedia webmaster Dave Mackey chronicling his time performing at the Xanadu Hotel in Freeport to his 5 yrs performing on a Disney Cruise ship up to the present day. Wilfred also reveals the exciting news to his international fans that he is at last available for bookings worldwide. Email him at : kingsong@myway.com Additionally, Wilfred mentions his phone contact info. during the interview. To hear Wilfred's interview click on the play button below. Three years ago Dr. Kenneth Dickie, a Plastic Surgeon with a thriving practice in Ontario Canada, moved his practice to Freeport. Having traveled to Grand Bahama several times over the past 15 years he and his wife Shawnie fell in love with the island and decided to make the move to Freeport. Dr. Dickie, through Sunrise Medical Center in Freeport, (formerly The Antoni Clinic) has established his new practice: "Bahamas Institute Of Plastic Surgery" where many international and local patients opt to have their procedures performed in the tranquil setting of Grand Bahama Island. In his interview with mackeymedia web master Dave Mackey, aside from discussing his vibrant plastic & reconstructive surgery practice, Dr. Dickie unveils his grand plan to establish a "Wellness & Anti-Aging Center" in conjunction with local physicians. Click on the play button below to journey with us into the fascinating world of tummy tucks, liposuction, breast reduction, augmentation & lifts, reconstructive surgery, face lifts, nose jobs, adominoplasty and many more procedures now possible on Grand Bahama Island by Dr. Kenneth Dickie, a plastic surgery practitioner for more than 20 years. Multi-talented Musician/ Artist Mike Hoyte interviewed by Web Master Dave Mackey at his family business "Hoytes Arts & Crafts" in Port Lucaya. Mike talks about his various different crafts including his Driftwood carvings, his Steel drum and Keyboard playing, his vegetarian life style and more. In this wit filled interview Mike also talks about his special ability to make Steel drums, a craft passed down from his late father affectionately known as "Little Sparrow". 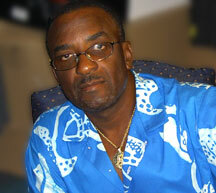 Mike Hoyte is featured on numerous present and past Bahamian hit songs on keyboards, Steel pans, percussion, drums and Background vocals. Mike is a frequent back up musician and arranger of tracks and vocal chorus arrangements at Mackeymedia. Mike's father The late "Little Sparrow" entertained visitors to our shores for many decades and is sadly missed. Click on the Play button below to hear this fun filled light hearted interview with this truly talented individual, Mike Hoyte. Click on his picture to view his artwork and family business. 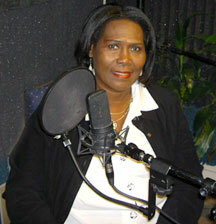 Your instructor Desi Wallace Swain teaches you the ins and outs of Bahamian dialect. For as with all cultures of the world, the Bahamas too has its own distinct colloquialisms. In this light hearted and entertaining interview Desi helps you decipher some of the words and phrases used by some Bahamians from the vast and ever changing lexicon of Bahamian Dialect. Press the play button below to listen and enjoy your first lesson in our continuing series of interviews on this delightful topic. In addition to being a Special Events Coordinator Desi is an account Executive for Bahamas National Radio Station 100JAMZ. Mackeymedia proudly presents an entertaining and enlightening interview with high energy Bahamian lead vocalist/ producer Jay Mitchell, a Bahamian entertainer that has spent the greater portion of his career in the distinctive category as one of the best that the Bahamas has to offer. From Jay's early days as an Otis Redding Clone and James Brown impersonator Jay Mitchell continues to mesmerize audiences. He presently performs at the British Colonial Hilton Hotel in Nassau, he is well loved by both the young and the not so young audiences that frequent this establishment. Jay Mitchell at one time was managed by Joe Jackson, Michael Jackson's father and he resided in the Jackson home. In his interview with Dave Mackey, Jay talks about his early beginnings at St. Stephens Anglican Church in Eight Mile Rock Grand Bahama, his musical career, carrying on his family's tradition of making "Bush Medicine", his life as a Reiki master teacher, traveling with Aretha Franklin, his experience performing at the Princess Hotel Casino for 13 years and lots more, You won't want to miss this ! Click on the Play button to hear it. Enjoy! Bahamian Artist Sheldon Saint interviewed at Mackeymedia tells his story. In this informative interview Sheldon reveals the incredible amount of dedication to his craft that it has taken for him to reach where his is today, a much sought after artist. He also talks about his inspiration, present and future plans plus lots more. For many years residents of Grand Bahama had the opportunity to see Saint's work at venues on the island including the Freeport Art Center. Now over 30 pieces of Saint's oil paintings will be on view to a broader audience in our nation's capital from May 5 th to 12th at The Central Bank Of The Bahamas. Locals and visitors alike will have the opportunity to see the masterful pieces this Grand Bahama artist has assembled. Click on the play button below to venture into the artistic world of Sheldon Saint through this enlightening interview. Also, click on his picture to view samples of his paintings and access his contact information for commissions and otherwise. We are saddened to announce that popular Bahamian Entertainer turned Gospel artist, Wendell Swain Armbrister, born in Murphy Town Abaco has died. Swain died at his home 7PM on Wednesday March 29, 2006 at the age of 63. We present herewith a streaming audio interview with Swain recorded 10:49AM April 26th 2005 when Swain was in fine form. He talks about "the good ol' days" when he performed with "The Mighty Makers", "Ezra and The Polka dots", "The Dynamics", "Skinner & Company" and "The Citations. Additionally, Swain, a Born Again Christian, discusses his transition from secular music to Gospel music. Click on the play button below to take a journey through the life of Wendell Swain Armbrister. For your spiritual enrichment and reflection on the life of Wendell Swain Armbrister we also provide Swain's rendition of the song "Coming Home" from his gospel album "Father's, We've Got To Save Our Children. Swain's survivors have numerous copies available for sale and could greatly utilize the funds derived. If you would like to purchase a copy of this album please click on the contact link above and we will forward your requests to his family. Note: This is now the entire unedited interview. After a long hiatus from the director's chair, beloved Freeport Players Guild actress / director Kay Hardy returns to the Directors Chair to direct the production of Charles Dickens "Oliver". This represents the 2nd time that Kay has been part of the directing team for "Oliver", however on this occasion Kay is the sole director. Her team includes Paula Schubert as musical director, Gloria McGlone is doing one on one voice work with the lead people, Sarah Kirkby (Kay's daughter) is the producer. The cast comprises 90 people. The cast includes Eddie Lambias, Nikki Paine, Conrad Knowles, Dr. Alan Bater, Andrea Gottlieb, Sophie & Chris Paine and many more. Oliver is slated to show early November 2005. In this audio interview with mackeymedia web master Dave Mackey, Kay enthusiastically elaborates on the behind the scenes work of putting the production together and gears us up for some great shows early November at the Regency Theatre on Grand Bahama Island. For more info. email oliverfreeport@yahoo.com Click on the play button to listen. WBA FEDECARIBE Heavyweight champion, Grand Bahamian born Sherman"The Caribbean Tank" Williams, talks about his successful career as a heavyweight boxer. In this exclusive streaming video interview at Mackeymedia, Sherman The Caribbean Tank takes us from the intriguing world of knockouts and decisions to his culinary arts skills and love of the kitchen. Not to be taken lightly, Sherman utters some chilling words of caution for his upcoming opponent. Sherman has knocked out 15 of his previous opponents , of whom he refers to as victims. A must see multimedia event, click on Sherman's picture above left to experience it. Enjoy! May 25, 2005 Grand Bahama M.P. for Marco City, Attorney Pleasant Bridgewater of Bridgewater & Co. stopped in to visit her old friend Dave Mackey for an informal and informative audio interview. We discussed her successful 2nd annual Marco City Heritage Festival, her transition from an opposition party senator to a governing party M. P. with the associated challenges and as an added bonus, Pleasant explains the process of setting up a Bahamian corporation and she elaborates on the requirements and fees for both Bahamians and non Bahamian nationals. Click on the play button below to hear and enjoy this enlightening interview. To contact Pleasant email: mmbridge42@yahoo.com or call (242) 351-5101to set up your Bahamian company or take care of your legal business. Mr. Donald McCartney, Newly appointed Deputy High Commissioner to the Dominion of Canada, provides a wealth of historical data on the Bahamas, The Turks and Caicos Islands and more. We briefly discuss CSME and its inevitable return, his book; "Bahamian Culture and Factors Which Impact Upon It " and his frustrations surrounding it. Mr. McCartney speaks of his humble beginnings in a two room house in Nassau under the strict guidance and discipline of his beloved mother and how this connects to his reputation as a strict disciplinarian. Mr. McCartney in no uncertain terms admonishes those in the public service to prepare for the changes being brought on by globalization. He also touches on his new book "The Journey and the Gift. " In this streaming audio interview with web master Dave Mackey, Donald McCartney, out spoken, opinionated and never short for words takes us on an educational and adventurous ride through his life. Mr. McCartney has served in the Bahamian education system (private and public) and in various capacities in the private sector and public service of The Bahamas for the past forty-three years, most recently as First Assistant Secretary in the Ministry of Public Service prior to pursuing studies at Georgia State University in Atlanta, Georgia. Click the play button below to hear this fascinating streaming audio interview that might be described as controversial by some. This interview was recorded July 8, 2005. We congratulate Mr. McCartney on his high achievement and as you will hear in this interview, he is well qualified. Enjoy!